Since graduating from RADA Joanna Page has worked throughout film, television and theatre. Her film roles include Judy in Richard Curtis’s Love Actually, Mike Figgis’s Miss Julie, From Hell and Very Annie Mary. Jo has worked extensively in London theatre, most recently in What the Butler Saw at Hampstead, which then transferred to the West End, as well as the Almeida, and the National – and Aladdin at the Old Vic. 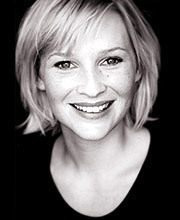 Jo’s television work includes David Copperfield, To the Ends of the Earth, Gideons Daughter, Ready When You Are Mr McGill, The Lost World, and Gavin and Stacey. She is the proud owner of a beautiful Jack Russell called Daisy.